Throughout the United States, rent levels have been rising. In particular, highly populated urban areas are becoming increasingly expensive to live in. Using data from Zillow, we created an interactive map detailing the average rent in the 50 most populous U.S. cities via BatchGeo. The average rent prices are based on a study conducted by Zillow on May 31, 2017. In order to analyze the data, graphs detailing the top 10 highest and lowest average rent cities were created. When it comes to high rent, no state can outdo California. The Golden State is home to the four cities with the highest average rent among the top 50 most populous. In particular, the Bay Area features the three highest rent cities among the top 50 most populous in the U.S. The average rent in San Francisco was nearly $1000 higher than San Jose at $4,285 whereas average rent in San Jose was $3,320. 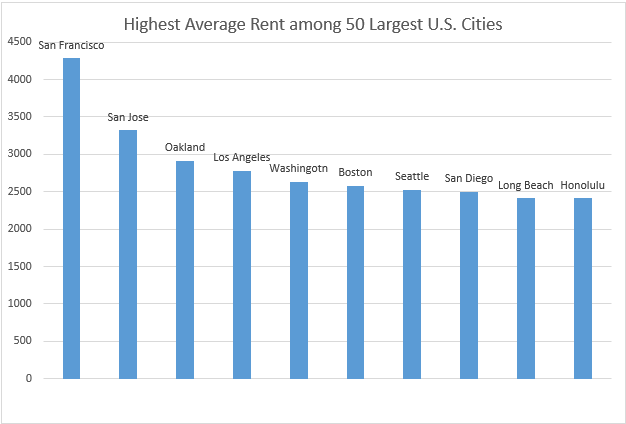 Oakland came in third with an average rent of $2913. High rent in the Bay Area is often associated with the tech boom of Silicon Valley. Following the three Bay Area cities was Los Angeles where the average rent as of May 31, 2017 was $2,776. Although average rent is usually not as high in the rest of the country as California, rent can still be steep in other parts of the country. 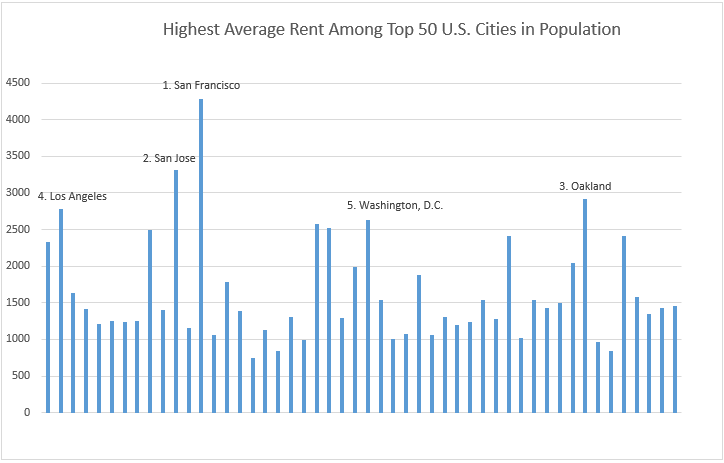 The city with the fifth highest average rent among the top 50 most populous was Washington D.C. at $2,632. Boston came next with average rental rates at $2,576. Four cities on the Pacific Ocean rounded out the top 10: Seattle, San Diego, Long Beach, and Honolulu all have average rental rates above $2,400. Amazingly, all eight cities with Pacific coastline among the top 50 most populous ranked in the top 15 in terms of highest average rent. The well-documented downturn of the American auto industry is a major reason for Detroit’s ranking as the city with the lowest average rent. Average rent in Detroit as of May 31, 2017 was just $749, over $3,500 lower than the average monthly rent in San Francisco. Another Great Lakes city, Cleveland, ranked second in lowest average rent at $839 per month. 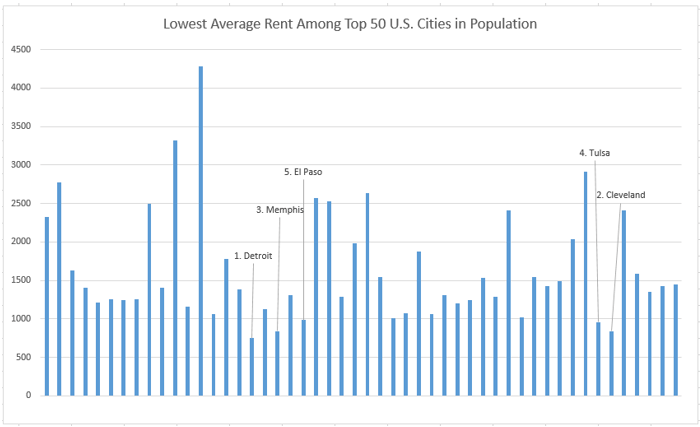 Coming in third in terms of lowest rent was Memphis. The Home of the Blues had an average rent of $841 per month. After Memphis, the average rent in major cities begins to approach $1000. 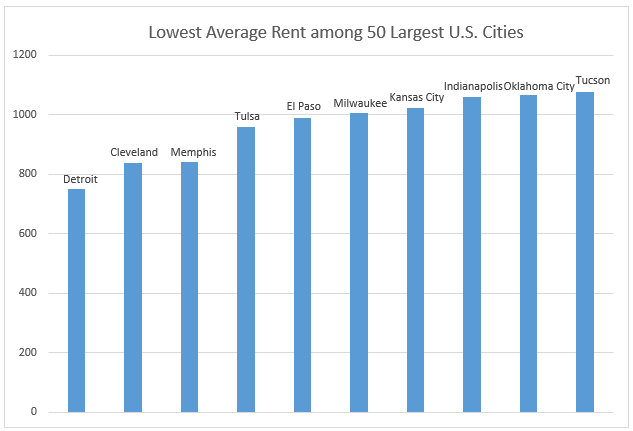 Tulsa had the fourth lowest average rent at a cost of $958 per month. Further southwest, El Paso rounded out the top five at $988 per month. Consistently, the cities with the lowest average rent were far from the Atlantic or Pacific Coasts. Though it has shoreline along Lake Michigan, Milwaukee had the sixth lowest average rent at an average cost of $1000. Kansas City, Indianapolis, Oklahoma City, and Tuscon completed the top ten, with each city maintaining an average rental rate between $1000-$1100. Although rent has been rising across the U.S., it is certainly higher in some areas than others. Specifically, rent in California’s coastal cities have the highest rents in the country. However, being near the coast is not the only factor in rental costs. Cities without coastline such as Denver, Austin, and Nashville rank within the top 20 in terms of highest rent. The average cost of rent in a given city comes from a combination of location, economic, and cultural factors. However, just because a city has a lower average rent does not mean it lacks economic or cultural opportunities. Remember, this study only involves the 50 largest U.S. cities and rents can be much lower in suburban and rural areas. Wherever you decide to live, make sure to consider the city’s average rent when making your choice.